It is not hard to admit that Ridley Scott's science fiction film Prometheus, released in 2012, was a disappointment, especially for fans of the Alien franchise. 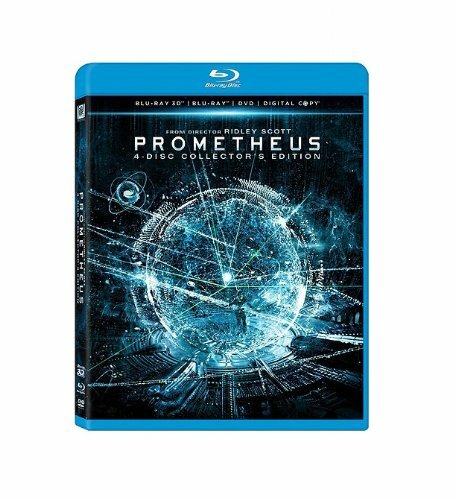 Certainly it is easy to dislike Prometheus after watching it for the first time, with (among others) the dumb crew members, inconsistent black goo, and alien abortion distracting from everything else the story has to offer. This is a shame, since it caused most viewers to mistakenly discard much of the remaining subtlety as plot holes. In particular, re-watching the movie reveals that the characters are far more developed and noteworthy than they seem at first. At its heart, Prometheus was designed almost as a sort of prequel to the events in Alien. This can be deduced by the fact that the Weyland Corporation has yet to become the Weyland-Yutani conglomerate. However, though there are many interesting similarities between LV-223 (the planet in Prometheus) and LV-426 (the planet in Alien), these two are not one and the same. Instead, the movie takes place in the same universe as the Alien franchise but does not fit directly into the time line of the quadrilogy. This positioning of Prometheus therefore adapts the most striking elements of the original movies, particularly the piloting chamber, android, and xenomorph threat itself, while allowing the narrative (lead by Sigourney Weaver-esque strong female characters) to take a new direction. The story is one of a quest for extra-terrestrial life rather than accidental discovery, with the character motivations and conflicts becoming just as important as the discovery itself. Four of the crew come to dominate the narrative: Vickers, Weyland, Shaw, and David, though the android is by far the most intriguing. Meredith Vickers is Weyland's daughter. Peter Weyland is obsessed with physical strength. He desires scientific discovery only in so far as it benefits him, as a means to a specific end. Vickers, in her role as heir to the immensely powerful Weyland Corporation, is the counterpoint to the spirit of scientific discovery. Her deepest desire is for her father to finally die so that she can take full control of his company, over which she has been fighting as his health declined. She does not want him to be successful in his mission of having the Engineers grant him immortality. This sentiment finds its root in the fact that she feels rejected by Weyland, a man who seems to have wanted a strong son to succeed him. When Weyland talks to David he calls him the closest thing to a son he'll ever have, and praises his immortality. David is also his creator's closest servant, and executes his wishes flawlessly. To compensate for this favoritism, Vickers accentuates her manliness by projecting an aura of emotionless strength, wearing clothes with padded shoulders, and doing push-ups immediately after awakening from stasis. Needless to say throughout the narrative she and David have an obviously antagonistic relationship. Shaw begins the movie as representative of scientific discovery in the purest sense. She wants to find humanity's creators, and thereby perhaps the answer to life's most fundamental questions. Though her Christian faith would presumably clash with this objective, it is more representative of an enduring optimism, a hope that any creators the mission does find will be benevolent (it is safe to assume that 80 years in the future religion has been largely reduced to its moral aspects). If they are then they would likely take their place as a concrete object of her faith. When it becomes obvious that the world they've arrived at is full of death rather than life, and Shaw is infected, David takes her cross, cutting her link to her hope for a brighter future. Indeed, at the end of the film when Shaw confronts the Engineer, she asks only why they want to destroy humanity - a question devoid of her original higher scientific goal. Hope, however, endures. She asks for her cross back and, in the final scene as she takes off in another alien vessel, explains that she is continuing her search for answers. David, though it is easy to see him only as a cunning, ruthless robot, is actually the movie's most complex and interesting character. He knows the Engineer language after studying a variety of early Earth dialects, and is thereby the closest to their mode of thought. Like Shaw, he also seems fascinated by the question of why the Engineers created humanity, and is disappointed with the simple answer ''because they could". Despite the fact that he has presumably been programmed by Weyland simply to assist him gain immortality, David does much investigating of his own, infecting Holloway so as to study him, and later attempting to put Shaw into cryostasis so that she can be studied back on Earth. He does not share his discoveries with the other crew members, and generally seems to be acting without outside guidance in the pursuit of knowledge about the Engineers, a species he deems as superior to humans. Maybe David is self motivated and perhaps he also considers himself to be superior to humans, and therefore wishes to be closer to their more advanced source. In any case his actions, more than those of any other crew member, represent scientific discovery. At the end of the film, after Shaw asks why the Engineers want to destroy humanity and is silenced, Weyland tells David to tell the Engineer why he came - i.e. to gain immortality. In the film's most interesting moment, David speaks to the giant. Is he asking Shaw's question, or explaining Weyland's mission? Or perhaps he is asking his own question, the one forgotten by Shaw - why did you create humanity? No answer is given, but the moment when the Engineer rests his hand on David's head is highly reminiscent of a father-son moment, or perhaps even of God breathing life in to Adam. In conclusion, though it is all to simple to dismiss Prometheus as a movie that leaves far too many questions unanswered throughout its narrative (not to be confused with actual plot holes, which are contradictory, illogical, or impossible events), its characters are worth noting. Add to this the ambiguity with regards to the Engineers themselves, and many different theories are possible. With some thought and speculation on the part of the viewer, this movie certainly becomes one worth watching.